In case you missed them in the fall; we would like to introduce you to the "C & M Bluegrass" band, they will be performing on Saturday, January 26th at 7:30pm. A Sister and Brother band with good traditional Bluegrass harmonies that only a family singing together since childhood can produce. Joined by Cathy's husband Rick of 38 years playing a solid hard driving rhythm upright bass , Jeff Causey on mandolin and last but not least by any measure they are proud to introduce you to one of the best 17 year old banjo pickers anywhere, Mr. Houston Slone from St. Mary's, Ohio. Only playing banjo for just over 2 years he is truly an amazing talent with command and drive of the instrument this young man has is amazing already. 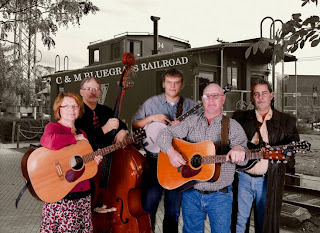 C & M was formed 5 years ago and have played many shows around the Miami Valley and Central & Eastern Ohio. Houston and Jeff joined about 2 years ago. Together they are really doing a fine show of good traditional bluegrass music combined with some fresh newer bluegrass music and some old country songs done in bluegrass style. It's great to see them return to Clifton! The Clifton Opera House is located at 5 So Clay Street, Clifton. Suggested door donation $7.00, box office opens at 6:30pm. Call 937-767-2343 for more information.